Los Angeles truck driver Alex Paz, right, was fired for trying to organize his coworkers. 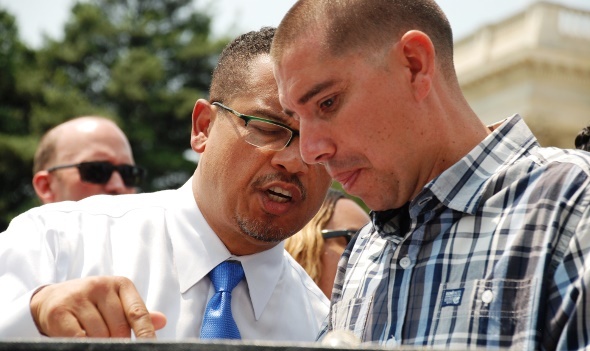 U.S. Rep. Keith Ellison (D-MN), left, has introduced a bill that would give workers like Paz more recourse against employers who fire workers for organizing activities. Los Angeles truck driver Alex Paz was fired when he attempted to organize his coworkers. Keyona Dandridge, a food service worker in Washington, DC, was told not to show up to work anymore after she struck for higher wages. The National Labor Relations Board (NLRB) gives workers like Paz and Dandridge a way to fight unlawful firings, but the bogged-down agency can take years to reach decisions. U.S. Rep. Keith Ellison (D-MN) wants to give workers a more effective way to fight back against employers who break the law. At a press conference on Capitol Hill this week, Ellison announced he was introducing a bill that would expand the National Labor Relations Act to include more protections for employees who are disciplined or fired for organizing activities. 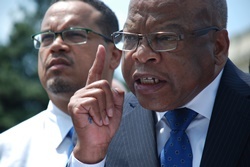 U.S. Rep. John Lewis (D-GA), right, is one of 15 co-sponsors of the Employee Empowerment Act, a bill introduced by Rep. Keith Ellison (D-MN), left, that would expand National Labor Relations Act protections for employees who are illegally fired for trying to organize their workplace. The Employee Empowerment Act, which has 15 co-sponsors, would allow employees to sue and seek punitive and compensatory damages from employers who interfere with their right to organize. Ellison says the bill would give working Americans a “private right of action” to sue employers. The threat of a lawsuit “would make [employers] think twice before firing workers for organizing,” said Ellison. The bill will encounter stiff opposition in the Republican-led House, but Ellison says he is counting on the labor and civil rights community to help garner support for it.